In our Mother’s Day display, we have a small box of Tintex Stocking Dye. We got curious about its background and its exact date. The dye is for nylon, rayon, cotton, lisle (a type of cotton thread), silk and wool. Now, rayon (or artificial silk or wood silk) dates from the Nineteenth Century and nylon‘s invention was in 1935 (with nylon stockings first going on sale on May 15, 1940). Therefore our box dates from after 1940. The original name of the dye, Victory Beige, has been stamped out and replaced with Bronzeskin. Like, the victory gardens of the war, the idea of Victory Beige is also suspect…a Google search of Victory Beige turned up nothing linking it to WWII (at least nothing in English). When it comes to Tintex, things get murky. Today there is a Tintex dye manufacturer in Australia and an industrial paint Tintex company of more international scope. We did find the modern-day descendant of our Tintex Stocking Dye at Manhattan Wardrobe Supply. And we also found out that you can still dye your nylons, as long as they aren’t coated with Teflon. 1.For restoring colour to faded stockings. 2.For giving a new fashionable colour to stockings. 3.For making odd stockings a matching colour. 4.For Keeping stocking colour fresh. This package is for stocking made of Nylon, rayon, cotton, silk, wool, lisle and mixtures. Wash stockings as usual and rinse well. Dissolve a little Tintex in sufficient warm water to cover the stocking completely. Dip stocking in this solution, turning and moving about until the desired shade is attained. To get a deeper shade, remove stockings, dissolve more Tintex and continue as before. Rinse thoroughly in cold water. Dry in the usual way. NOTE: TO give a new different colour to stockings, or to re-dye odd stockings to a matching colour, first use Tintex Colour Remover. This takes out sufficient old colour. 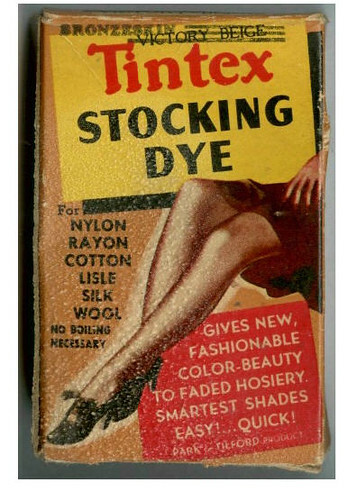 Then Tintex your stockings to colour desired. When removing colour from stockings, the Colour Remover bath should be well under the boil. Unfortunately, Park & Tilford mostly leads to North Vancouver’s shopping mall. We found a number of perfumes from Park & Tilford, the distributors of our Tintex Stocking Dye, but no history on them. 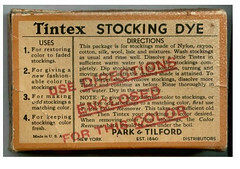 4.Tintex Stocking Dyes – For faded or mis-mated stockings of Nylon, rayon, silk , cotton, wool or lisle. 6.Whitex Wonder Bluing – For all white material. I never knew that such a thing existed! I am so enjoying reading about your museum and the interesting things in it. Thank you for your nice words, Rurality. We didn’t know this existed either. There are a lot of other bits and pieces we’ll investigate in upcoming posts. We have a nearly identical item here at the Atlanta History Center, except it is labeled “WINE BLUSH”. Has a late date been establised for your object? Hello: I read your posting with great interest. I just purchased 2 boxes of the Stocking Dye, still in excellent condition, at a flea market (9-4-11) for 50 cents. I was curious as to its history. Mine are labeled “Wine Blush” and “Butter Brown” In the same purchase was also enclosed a card labeled “Lou Sil” Mending Twist. 120 yards. There are 8 different colors of mending threads……none of the threads had ever been used. This was what collecting is all about, finding these small treasures. Thank you for your posting.